Taal Volcano (Filipino: Bulkang Taal) is a complex volcano located on the island of Luzon in the Philippines. It is the second most active volcano in the Philippines with 33 historical eruptions. All of these eruptions are concentrated on Volcano Island, an island near the middle of Taal Lake. The lake partially fills Taal Caldera, which was formed by prehistoric eruptions between 140,000 and 5,380 BP. Viewed from the Tagaytay Ridge in Cavite, Taal Volcano and Lake presents one of the most picturesque and attractive views in the Philippines. It is located about 50 kilometres (31 miles) south of the capital of the country, the city of Manila. 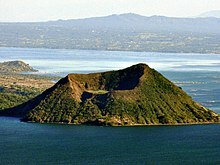 Aerial photo of Taal Volcano; North is on right-hand side of photo. As of 1821, the Taal Volcano was also called Bombou. Taal Volcano is one of the 16 Decade Volcanoes. Taal Volcano and Lake are wholly located in the province of Batangas. The northern half of Volcano Island falls under the jurisdiction of the lake shore town of Talisay, and the southern half to San Nicolas. The other communities that encircle Taal Lake include the cities of Tanauan and Lipa, and the municipalities of Talisay, Laurel, Agoncillo, Santa Teresita, Alitagtag, Cuenca, Balete and Mataas na Kahoy. Permanent settlement on the island is prohibited by the Philippine Institute of Volcanology and Seismology or PHIVOLCS, declaring the whole Volcano Island as a high-risk area and a Permanent Danger Zone (PDZ). Despite the warnings, poor families have settled on the island, risking their lives, earning a living by fishing and farming crops from the rich volcanic soil. The crater lake on Volcano Island is the largest lake on an island in a lake on an island in the world. Moreover, this lake contains Vulcan Point, a small rocky island that projects from the surface of the crater lake, which was the remnant of the old crater floor that is now surrounded by the 2-kilometre (1.2 mi) wide lake, now referred to as the Main Crater Lake. Vulcan Point is often cited as the largest third-order island (island in a lake on an island in a lake on an island) in the world, though this is also claimed to be an unnamed Canadian island located within Victoria Island. Therefore, Taal has an island within a lake, that is on an island within a lake, that is on an island within the sea: Vulcan Point Island is within Main Crater Lake, which is on Volcano Island, which is within Taal Lake, which is on the main Philippine Island Luzon, which is within the western Pacific Ocean. A solar-powered remote monitoring station located at Taal Volcano island. Taal Volcano is a complex volcano located on the island of Luzon in the Philippines. Although the volcano has been quiet since 1977, it has shown signs of unrest since 1991, with strong seismic activity and ground fracturing events, as well as the formation of small mud pots and mud geysers on parts of the island. The Philippine Institute of Volcanology and Seismology (PHIVOLCS) regularly issues notices and warnings about current activity at Taal, including ongoing seismic unrest. From April 9 to July 5, Alert Level on Taal Volcano was raised from 1 to 2 for eleven weeks because of increased seismicity on Volcano Island. Frequency peaked to about 115 tremors on May 30 with maximum intensity at IV, accompanied by rumbling sounds. Magma was intruding towards the surface, as indicated by continuing high rates of CO2 emissions in the Main Crater Lake and sustained seismic activity. Field measurements on 24 May 2011 showed lake temperatures slightly increased, pH values slightly more acidic and water levels 4 cm higher. A ground deformation survey conducted around the Volcano Island 26 April – 3 May 2011 showed that the volcano edifice inflated slightly relative to the 05-11 April 2011 survey. June 8. PHIVOLCS raised the volcano status to Alert Level 2 (scale is 0–5, 0 referring to No Alert status), which indicates the volcano is undergoing magmatic intrusion which could eventually lead to an eruption. PHIVOLCS reminds the general public that the Main Crater remains off-limits because hazardous steam-driven explosions may occur, along with the possible build-up of toxic gases. Areas with hot ground and steam emission such as portions of the Daang Kastila Trail are considered hazardous. May 11–24. Crater lake temperature increased by 2–3 °C (3.6–5.4 °F). The composition of Main Crater Lake water has shown above normal values of Mg/Cl, SO4/Cl and Total Dissolved Solids. There has been ground steaming accompanied by hissing sounds on the northern and northeast sides of the main crater. April 26. Volcanic seismicity had increased. July 20. National Disaster Coordinating Council (NDCC) executive officer Glenn Rabonza warned that although there were no volcanic quakes detected at Taal since the detection of nine volcanic quakes from June 13 to July 19, and there had been no steaming activity monitored since last recorded on June 23, PHIVOLCS Alert stands at Level 1, warning that Taal’s main crater is off-limits to the public because steam explosions may occur or high concentrations of toxic gases may accumulate. Taal Volcano provides a picturesque view from Tagaytay. August 28. PHIVOLCS notified the public and concerned authorities that the Taal seismic network recorded ten (10) volcanic earthquakes from 5:30 AM to 3 PM. Two (2) of these quakes that occurred at 12:33 and 12:46 PM, were both felt at intensity II by residents at barangay Pira-piraso. These quakes were accompanied by rumbling sounds. The events were located northeast of the volcano island near Daang Kastila area with depths of approximately 0.6 kilometres (0.37 miles) (12:33 PM) and 0.8 kilometres (0.50 miles) (12:46 PM). Taal Volcano is part of a chain of volcanoes along the western side of the edge of the island of Luzon, which were formed by the subduction of the Eurasian Plate underneath the Philippine Mobile Belt. Taal Lake lies within a 25–30 km (16–19 mi) caldera formed by explosive eruptions between 140,000 and 5,380 BP. 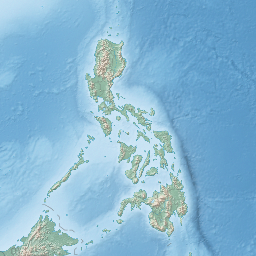 Each of these eruptions created extensive ignimbrite deposits, reaching as far away as where Manila stands today. There have been 33 recorded eruptions at Taal since 1572. The first eruption of which there is any record occurred in 1572, the year the Augustinian friars founded the town of Taal on the shores of the lake (on what is now San Nicolas, Batangas). In 1591, another mild eruption took place featured by great masses of smoke issuing forth from the crater. From 1605 to 1611, the volcano displayed such great activity that Father Torna de Abreu had a huge cross of anubing wood erected on the brink of the crater. Between 1707 and 1731, the center of activity shifted from the Main Crater to other parts of Volcano Island. The eruptions of 1707 and 1715 occurred in Binitiang Malaki crater (the cinder cone visible from Tagaytay City). Minor eruptions also emanated from the Binintiang Munti crater on the westernmost tip of the island in 1709 and 1729. A more violent event happened on September 24, 1716, when the whole southeastern portion of the crater (Calauit), opposite Mount Macolod, was blown out. The 1731 eruption off Pira-Piraso or eastern tip of the island created an island. No studies had been done to determine whether Napayon or Bubuin Island was formed in the eruption, or just a pumice raft. Activity returned to the Main Crater in 1749, and it was remembered for being particularly violent (VEI = 4). Then came the great 200-day eruption of 1754, the greatest eruption of Taal which is described below. Taal remained quiet for 54 years except for a minor eruption in 1790. Not until March 1808 did another big eruption occur. While this outbreak was not as violent as the one in 1754, the immediate vicinity was covered with ashes to a depth of 84 centimetres (33 in). It brought great changes in the interior of the crater, according to chroniclers of that time. "Before, the bottom looked very deep and seemed unfathomable, but at the bottom, a liquid mass was seen in continual ebullition. After the eruption, the crater had widened and the pond within it had been reduced to one-third and the rest of the crater floor was higher and dry enough to walk over it. The height of the crater walls has diminished and near the center of the new crater floor, a little hill that continually emitted smoke. On its sides were several wells, one of which was especially remarkable for its size." On May 15, 1754, at about 9 or 10 o'clock in the night, the volcano quite unexpectedly commenced to roar and emit, sky-high, burning flames intermixed with glowing rocks which, falling back upon the island and rolling down the slopes of the mountain, created the impression of a large river of fire. During the following days there appeared in the lake a large quantity of pumice stone which had been ejected by the volcano. Part of these ejecta had also reached the hamlet of Bayuyungan and completely destroyed it. The volcano continued thus until June 2, during the night of which the eruption reached such proportions that the falling ejecta made the entire island appear to be on fire, and it was even feared that the catastrophe might involve the shores of the lake. From the said 2nd of June until September 25, the volcano never ceased to eject fire and mud of such bad character that the best ink does not cause so black a stain. During the night of September 25, the fire emitted was quite extraordinary and accompanied by terrifying rumblings. The strangest thing was, that within the black column of smoke issuing from the volcano ever since June 2, there frequently formed thunderstorms, and it happened that the huge tempest cloud would scarcely ever disappear during two months. At daybreak of September 26 we found ourselves forced to abandon our dwelling for fear lest the roofs come down upon us under the weight of ashes and stones which had fallen upon them during that hapless night. In fact, some weaker buildings collapsed. The depth of the layer of ashes and stones exceeded two "cuartas" (45 centimeters), and the result was that there was neither tree nor other plant which it did not ruin or crush, giving to the whole region an aspect as if a devastating conflagration had swept over it. After this the volcano calmed down considerably, though not sufficiently to offer any prospect of tranquility. We left the town, fleeing this living picture of Sodom, with incessant fear lest the raging waters of the lake overtake us, which were at the moment invading the main part of the town, sweeping away everything they encountered. On the outskirts of the town, I came upon a woman who was so exhausted by her burden of two little children and a bundle of clothing that she could proceed no farther. Moved by pity, I took one of the toddlers from her and carried him, and the little indio who has been wailing while in the arms of his mother, stopped short when I took him into mine and never uttered a sound while I was carrying him a good piece of the way. Having reached a secure place on elevated ground at a distance of about half a league (2 kilometres or 1.2 miles) from the town, we halted in a hut to rest a little and take some food. From this spot the volcano could be contemplated with a little more serenity of mind. It still continued in full fury, ejecting immense masses of material. Now I also observed that the earth was in continuous, swaying motion, a fact which I had failed to notice during the excitement and fear of the flight. Shortly afterward the volcano suddenly subsided almost suddenly; its top was clear and apparently calm. We, therefore, returned on the following day, the 29th, to the town with the intention of surveying the havoc wrought during the preceding night. The 29th had dawned calm, but while we were still trying to persuade ourselves that the tragedy was over and the volcano had exhausted its bowels, at about 8 o'clock, we heard a crash and then I noticed that smoke was rising from the point of the island that looks towards east. The smoke spread very gradually as far as the crater of the volcano, while there were many whiffs issuing from points in the direction of another headland. I realized that the island had opened in these places and fearing that, if a crater should open below the water, an explosion might follow, much more formidable than the preceding ones, I mounted a horse and retired permanently to the Sanctuary of Caysasay. Between 3 and 4 o'clock in the afternoon of the said 29th, it began to rain mud and ashes at Caysasay (12 miles or 19 kilometres from the volcano) and this rain lasted three days. The most terrifying circumstance was that the whole sky was shrouded in such darkness that we could not have seen the hand placed before the face, had it not been for the sinister glare of incessant lightnings. Nor could we use artificial light as this was extinguished by the wind and copious ashes which penetrated everywhere. All was horror those three days, which appeared rather like murky nights and we did not occupy ourselves with anything but see to it that the natives swept off the roofs the large quantities of ashes and stones which kept on accumulating upon them and threatened to bring them down upon us, burying us alive beneath their weight. But fearing that even these precautions might prove unavailing, we 3 Europeans – viz. Fr. Prior, the Alcalde, and myself – the only ones who were at the time in the Convento of Caysasay, took refuge on the landing of the stairs; as the safest place, and awaited there whatever God might dispose with regard to us. To all this was added incessant thunder and lightning, and it really looked as if the world was going to pieces and its axis had been displaced. During the night of the 30th we had not a moment of repose, as every moment we heard the loud crush of houses collapsing under of stones, mud, and ashes piled upon them, and feared that the turn of the convento and the church of Casasay would come in next. Shortly before daybreak of December 1 there was a tremendous crash as if the house were coming down on our heads: the roof of the apse of the church had caved in! Not long afterward, the roof of their kitchen gave away with a thud. Both were tile roofs. The first of December broke somewhat clear and our eyes contemplated everywhere ruins and destruction. The layer of ashes and mud was more than 5 spans [1.10 m] thick, and it was almost a miracle that the roof of the church and convento sustained so great a weight. We caused the bulk of the material to be removed, while new continued to fall on that day and the following, on which latter the direction of the wind changed, carrying the ejecta toward Balayan. On the 3rd and 4th we had a formidable typhoon, and thereafter the volcano quieted down. Soon afterward I resolved to visit my town of Taal; nothing was left of it except the walls of the church and convento. All the rest, the government house, the walks of the rope factory, the warehouse, everything was buried beneath a layer of stones, mud, and ashes more than 10 spans [2.20 m] thick; only here and there could be seen an upright post, the only remnant of a comfortable dwelling. I went down to the river and found it completely filled up, with a boat belonging to the alcalde and many of private persons buried in the mud. After incredible efforts I finally succeeded in unearthing in what had once been the church and sacristy, the chests which contained the sacred vestments and vessels. Nearly all of them were demolished by the rocks and beams which had fallen upon them, and filled with foul-smelling mud that had ruined or disfigured their contents. With the aid of some natives of Bauang, I likewise recovered some property from among the ruins of the convento. Twelve persons are known to have perished – some carried away by the waves of the lake, others crushed beneath their collapsing houses. Thus the beautiful town of Taal remains a deserted wilderness and reduced to the utmost misery, while once it was one of the richest and most flourishing places. In the villages to the west of the lake, which were the greater and better part, all the houses have either collapsed under the load of material which had been piled upon them or have disappeared completely, swept away by the waves which in these places were so violent that they dug three ditches or channels, too wide and deep to be forded, and thus rendered impassable the road which joins the town with Balayan. In other parts of the lake shore have likewise opened many cracks and occurred very extensive slides. The worst of all is, that, the mouth of the river Pansipit having been blocked, the lake is rising and invading the towns of Lipa and Tanauan, both being on the lowest level, and inundating their buildings. All the animals of whatever kind have perished, some by being buried, others by drowning, the rest by starving, as not a green blade remained anywhere. The same fate as Taal has befallen the towns of Lipa, Tanauan, and so much of Sala as still existed. These towns, together with Taal, lay around the lake, being situated within easy reach of it, and less than one league (12 miles or 19 kilometres) from the volcano. The bulk of the population left this neighborhood and settled in more distant places. Thus out of 1200 taxpayers whom Taal contained formerly, hardly 150 remain in the poorest and least respectable villages, which suffered little from the rain of ashes. Taal Volcano's crater before the 1911 eruption with the central cone and one of the lakes on the crater floor. One of the more devastating eruptions occurred in January 1911. During the night of the 27th of that month, the seismographs at the Manila Observatory commenced to register frequent disturbances, which were at first of insignificant importance, but increased rapidly in frequency and intensity. The total recorded shocks on that day numbered 26. During the 28th there were recorded 217 distinct shocks, of which 135 were microseismic, while 10 were quite severe. The frequent and increasingly strong earthquakes caused much alarm at Manila, but the observatory staff was soon able to locate their epicenter in the region of Taal Volcano and assured the public that Manila was in no danger, as Taal is distant from it some 60 km (37 mi) away. In Manila, in the early hours of 30 January 1911, people were awakened out of their sleep by what they at first perceived as loud thunder. The illusion was heightened when great lightning streaks were seen to illuminate the southern skies. Those who investigated further, however, soon learned the truth. A huge, fan-shaped cloud of what looked like black smoke ascended to great heights. It was crisscrossed with a brilliant electrical display, which the people of Manila perceived for lightning. This cloud finally shot up in the air, spread, then dissipated, and this marked the culmination of the eruption, at about 2:30 a. m.
On Volcano Island, the destruction was complete. It seems that when the black, fan-shaped cloud spread, it created a blast downward that forced hot steam and gases down the slopes of the crater, accompanied by a shower of hot mud and sand. Many trees had the bark shredded and cut away from the surface by the hot sand and mud blast that accompanied the explosion and contributed so much to the loss of life and destruction of property. The fact that practically all the vegetation was bent downward, away from the crater, proved that there must have been a very strong blast down the outside slopes of the cone. Very little vegetation was actually burned or even scorched. Six hours after the explosion, dust from the crater was noticeable in Manila as it settled on furniture and other polished surfaces. The solid matter ejected had a volume of between seventy million and eighty million cubic metres (2.5×109 and 2.8×109 cubic feet) (VEI = 3.7). 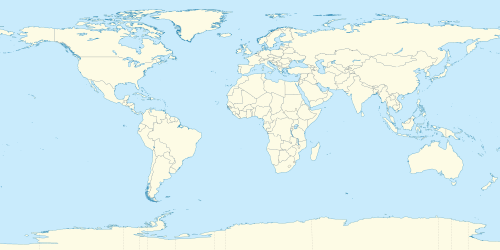 Ashes fell over an area of 2,000 square kilometres (770 square miles), although the area in which actual destruction took place measured only 230 square kilometres (89 sq mi). The detonation from the explosion was heard over an area more than 600 miles (970 km) in diameter. The eruption claimed a reported 1,335 lives and injured 199; although it is known that more perished than the official records show. The seven barangays that existed on the island previous to the eruption were completely wiped out. Post mortem examination of the victims seemed to show that practically all had died of scalding by hot steam or hot mud, or both. The devastating effects of the blast reached the west shore of the lake where a number of villages were also destroyed. Cattle to the number of 702 were killed and 543 nipa houses destroyed. Crops suffered from the deposit of ashes that fell to a depth of almost half an inch in places near the shore of the lake. Volcano Island sank from three to ten feet as a result of the eruption. It was also found that the southern shore of Lake Taal sank in elevation from the eruption. No evidences of lava could be discovered anywhere, nor have geologists been able to trace any visible records of a lava flow having occurred at any time on the volcano back then. Another peculiarity of the geologic aspects of Taal is the fact that no sulphur has been found on the volcano. The yellow deposits and encrustations noticeable in the crater and its vicinity are iron salts, according to chemical analysis. Slight smell of sulfur was perceptible at the volcano, which came from the gases that escape from the crater. Ten years after the eruption, no changes in the general outline of the island could be discerned at a distance. On the island, however, many changes were noted. The vegetation had increased; great stretches that were formerly barren and covered with white ashes and cinders became covered with vegetation. The most recent period of activity lasted from 1965 to 1977 with the area of activity concentrated in the vicinity of Mount Tabaro. The 1965 eruption was classified as phreatomagmatic, generated by the interaction of magma with the lake water that produced the violent explosion that cut an embayment on Volcano Island. The eruption generated "cold" base surges which travelled several kilometers across Lake Taal, devastating villages on the lake shore and, killing about a hundred people. That eruption, in particular, led to the recognition of base surge (one of the American geologists who witnessed an atomic bomb explosion as a soldier and visited the volcano shortly after the 1965 eruption, compared it to an atomic base surge) as a process in volcanic eruption, which are now called pyroclastic surges when relating to volcanoes. The population of the island was evacuated only after the onset of the eruption. Precursory signs were not interpreted correctly until after the eruption. Cinder cone and embayment created by the 1965 eruption. After nine months of repose, Taal reactivated on July 5, 1966 with another phreatomagmatic eruption from Mount Tabaro, followed by another similar eruption on August 16, 1967. The strombolian eruptions which started five months after on January 31, 1968 produced the first historical lava fountaining witnessed from Taal. Another strombolian eruption followed a year later on October 29, 1969. The massive flows from the two eruptions eventually covered the bay created by the 1965 eruption, reaching the shore of Lake Taal. The last major activities on the volcano were the phreatic eruptions of 1976 and 1977. On the Main Crater Lake, changes in the water temperature, level, and bubbling or boiling activity on the lake. Before the 1965 eruption began, the lake's temperature rose to about 15 °C (27 °F) degrees above normal. However, on some eruptions there is no reported increase in the lake's temperature. Ground inflation or ground fissuring. Increase in temperature of ground probe holes on monitoring stations. Strong sulfuric odor or irritating fumes similar to rotten eggs. Fish kills and drying up of vegetation. Volcanologists measuring the concentration of radon gas in the soil on Volcano island measured an anomalous increase of the radon concentration by a factor of six in October 1994. This increase was followed 22 days later by the magnitude 7.1 Mindoro earthquake on November 15, centered about 50 kilometres (31 miles) south of Taal, off the coast of Luzon. A typhoon had passed through the area a few days before the radon spike was measured, but when Typhoon Angela, one of the most powerful to strike the area in ten years, crossed Luzon on almost the same track a year later, no radon spike was measured. Therefore, typhoons were ruled out as the cause, and there is strong evidence that the radon originated in the stress accumulation preceding the earthquake. ^ a b c "Taal Volcano". Global Volcanism Program. Smithsonian Institution. Retrieved 2013-02-13. ^ Roberts, Edmund (1837). Embassy to the Eastern Courts of Cochin-China, Siam, and Muscat. New York, NY: Harper & Brothers. p. 60. ^ "NDCC Orders Close Watch on Mayon, Taal Volcanoes". GMA News Online. July 21, 2009. Retrieved 2011-02-13. ^ "Some interesting islands and lakes". Elbruz. Retrieved 2014-02-01. ^ "This ridiculous little island won't BLOW your mind, but it will BEND it…". Retrieved 12 February 2016. ^ "World's Largest Island-in-a-lake-on-an-island-in-a-lake-on-an-island Seen on Google Earth". Retrieved 2016-02-12. ^ "Alert level 2 raised at Taal volcano". The Philippine Star. June 9, 2010. Archived from the original on September 6, 2012. Retrieved 2011-02-13. ^ Philippine Institute of Volcanology and Seismology (28 May 2011). "Taal Volcano Bulletin". PHIVOLCS Website. Department of Science and Technology. Retrieved 28 May 2011. ^ a b c Knittel, Ulrich (March 18, 1999). "History of Taal's activity to 1911 as described by Fr. Saderra Maso". Saderra Maso: Historical Taal. Institut für Mineralogie und Lagerstättenlehre. Retrieved 2009-03-26. Wikivoyage has a travel guide for Taal Volcano. "Taal Volcano". Global Volcanism Program. Smithsonian Institution. Retrieved 2018-03-06.